Thanks again Jenny. You rock! 2. 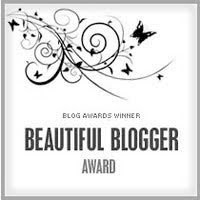 Pass this award on to 7 bloggers you have recently discovered and whom you think are fantastic. 1) I left the world of structural engineering to stay at home with my daughter. 2) I've only been sewing for about 14 months. 3) I love to bake, but I'm not as thrilled about cooking. 4) I have reservations at Serendipity3 in NYC on Tuesday to eat an amazingly huge dessert, and I might not share. 5) I love Mexican food. 6) I am very proud of my husband for what he does at home and at work. 7) I love cooked tomatoes, but can't stand them raw.